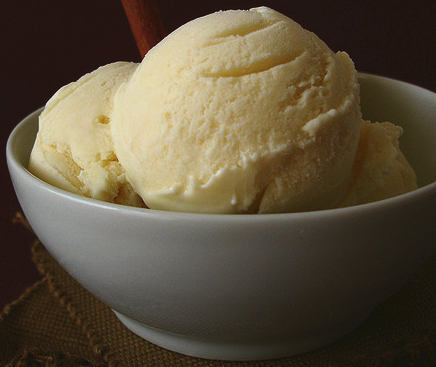 A delicious treat, rich and creamy Cinnamon Ice Cream. Great spice mouth feel. In a saucepan, combine heavy cream and milk. Scrape in seeds from vanilla beans; add beans. Bring just to simmer. Whisk sugar and yolks in large bowl to blend. Gradually whisk in hot cream mixture. Return mixture to same saucepan. Stir over medium-low heat until custard thickens and leaves path on back of spoon when finger is drawn across, about 6 min. (do not boil). Strain into large bowl. Whisk in ground cinnamon. Chill until cold, about 3 hours. Transfer custard to ice cream maker and process according to manufacturer’s instructions. Transfer ice cream to a covered container and freeze until firm. (Can be made 3 days ahead. Keep frozen). Pour the cooked custard into a bowl, then put the bowl in the freezer for about one and a half hrs until it starts to freeze around the edges. Stir well, repeat process twice more until the mix is smooth. Freeze until needed in a suitable container. Wanna try this ice cream recipe. looks easy.